Waste to this year’s crop. A couple of days ago I was invited over to a friend’s place for a visit, mostly for sharing some food and lots of catching up and fun conversation. Since it was my first time there, all of us who had gathered went for a walk in the adjacent fields for some exercise and to see for ourselves what devastation had occurred after a recent severe thunderstorm in the area. My friend’s family have a huge cherry orchard that they have been tending for a couple of generations. Such a weird fluke of a storm luckily happens infrequently; however, when it does, the effects are essentially a year’s fruit production completely gone to waste. I was told that the cherries on all the orchard trees were only days away from being fully ripe to be picked and processed. And then nature stepped in…. In the next photos you will get to see the flip side…..no beautifully formed cherries hanging from the branches, which would usually tempt us to pick them for a treat. The last two photos show the specialized machinery that is used to shake the cherries from the trees – as the fruit has to be collected regardless – to clear the trees for the remaining growth and recovering phases. Sky-filled darkened clouds create dramatic expectation! On my walk last week. Fascinating how looking to the west at one point sets the mood for something….that pause in the air. What might happen! And then 10 minutes further down the road. I look toward the east, and it’s an entirely different light and mood. This week’s theme for the photography assignment was “Anything Rural,” and so today was my opportunity to go for my walk. I know from occasional comments on some earlier posts that focused on my walks that some of you enjoy joining me, so I welcome you along again. I didn’t have anything specific in mind, other than I just knew that I’d find something to fit that theme. Which meant there’d be all sorts of surprises! 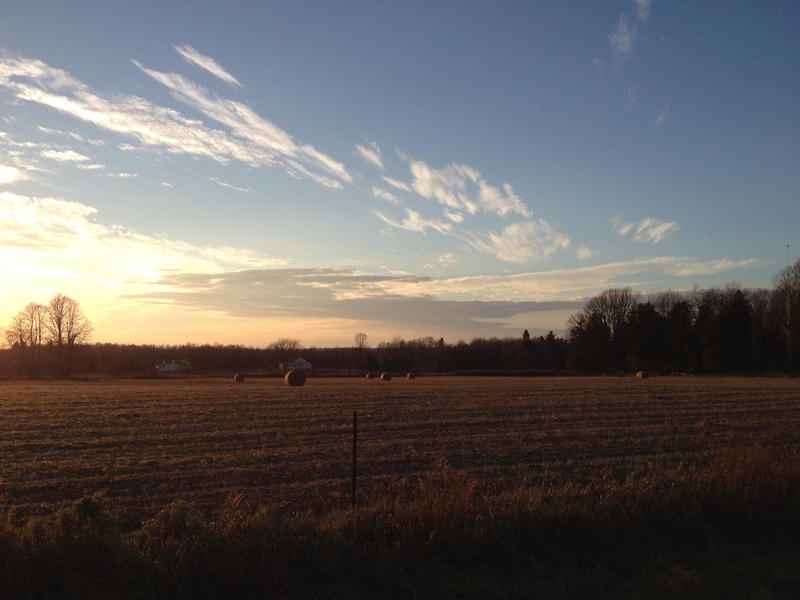 Taken in the early evening…..I’ve always found the “jumbled” look of a collection of rural mailboxes fun to look at. They look like a group of old cronies hanging out, just “shooting the breeze” – some leaning forward, some leaning back, some slanted. Different mailboxes have different bases – with cement or just wooden poles – creating that uneven look. And sometimes that jumbled look is caused by a touch of vandalism. Every once in a long while, someone gets the “bright” idea to go waling at innocent mailboxes with a baseball bat…..you get the idea. Home to ducks and frogs. Primarily, this pond is the home of several duck families….and a host of loud and delightfully raucous peeper frogs, singing with heart and soul in the evenings until dusk and into dark. I love this little wildlife habitat. Since I was walking with the approaching sunset, the lighting has some things jump out more. In this case, I was enjoying the sight of the newly sprouted bright green plantings in another nearby farm field. I love looking at the even rows throughout the field and then a bit of criss-crossing with the oblique lines from the tractor tire tracks. Again, for my last submission, I pick my most favie of the bunch….a flower. And a special one at that. The trillium; the provincial flower of Ontario. It only grows in wooded areas, and this one I spotted in a small woods adjacent to a small bungalow, along the main country road where I walk. It’s actually that small wooded area on the left side in my #3 photo. The trillium is a protected flower, in order to prevent overpicking and so that we and future generations may always enjoy seeing its lovely, white, three petalled beauty in the month of May. On my walk on Thursday (two days ago), it was one of our last warmer autumn days – it felt more like September than November! – and I was curious what I would see this time. 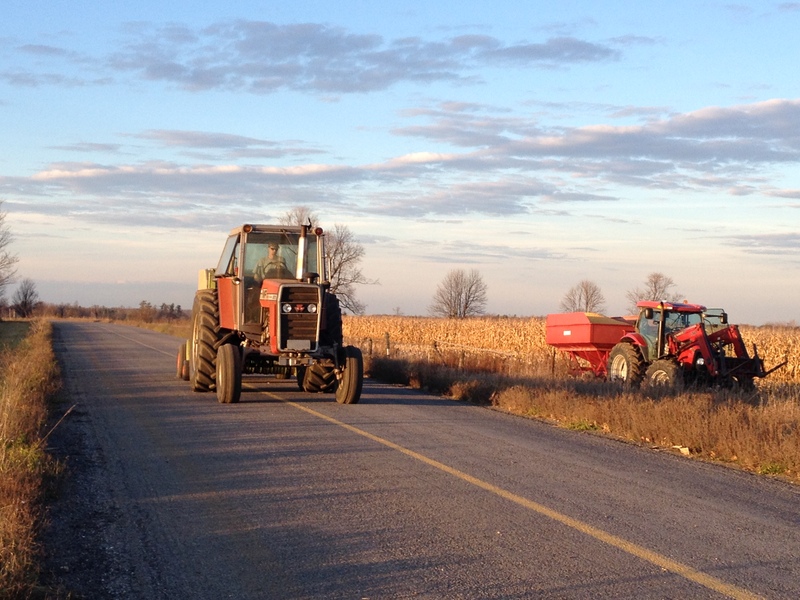 I didn’t anticipate seeing all the various farm vehicles out and about. 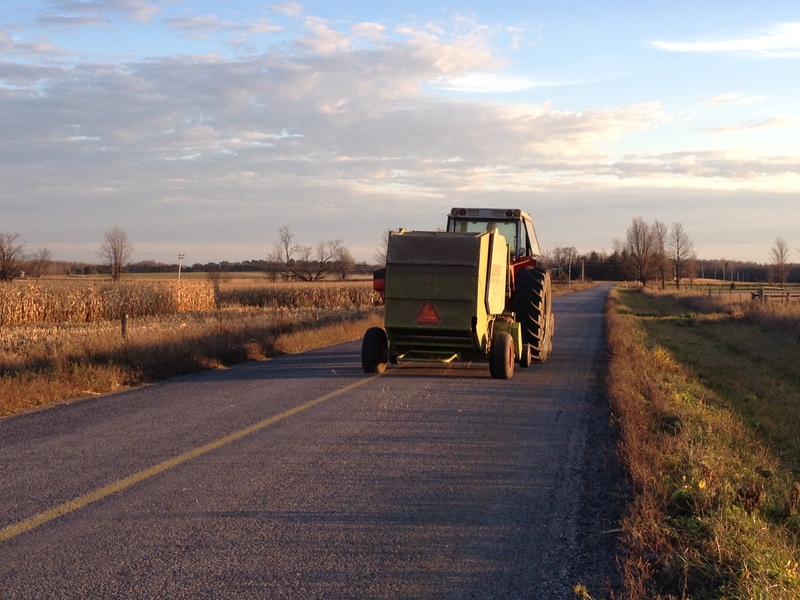 On some days, I might see one tractor in a field. 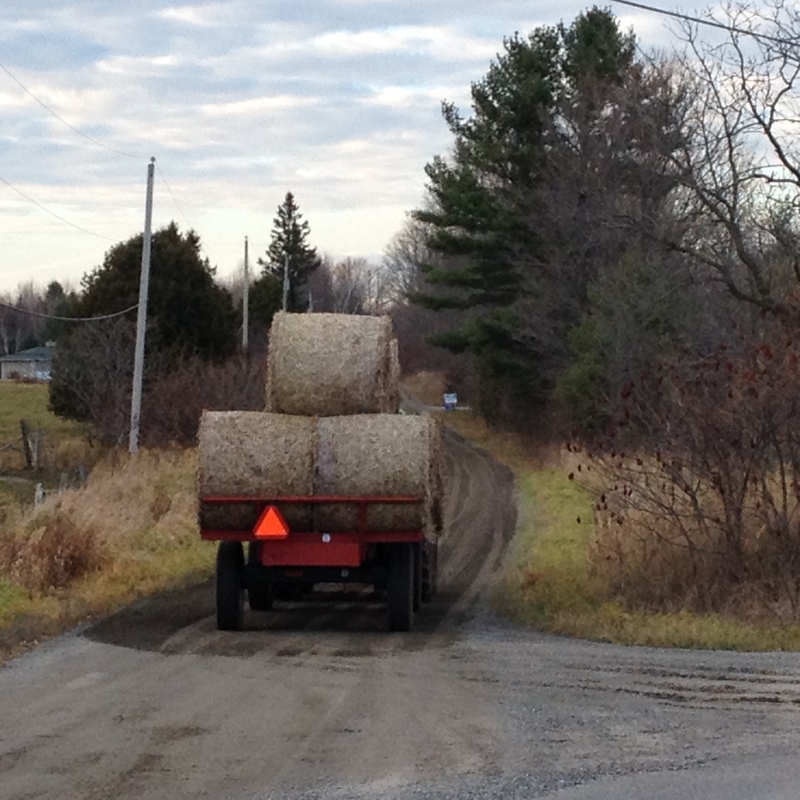 But this day started right away with a tractor pulling hay bales up the road and turning down onto the road where I live. 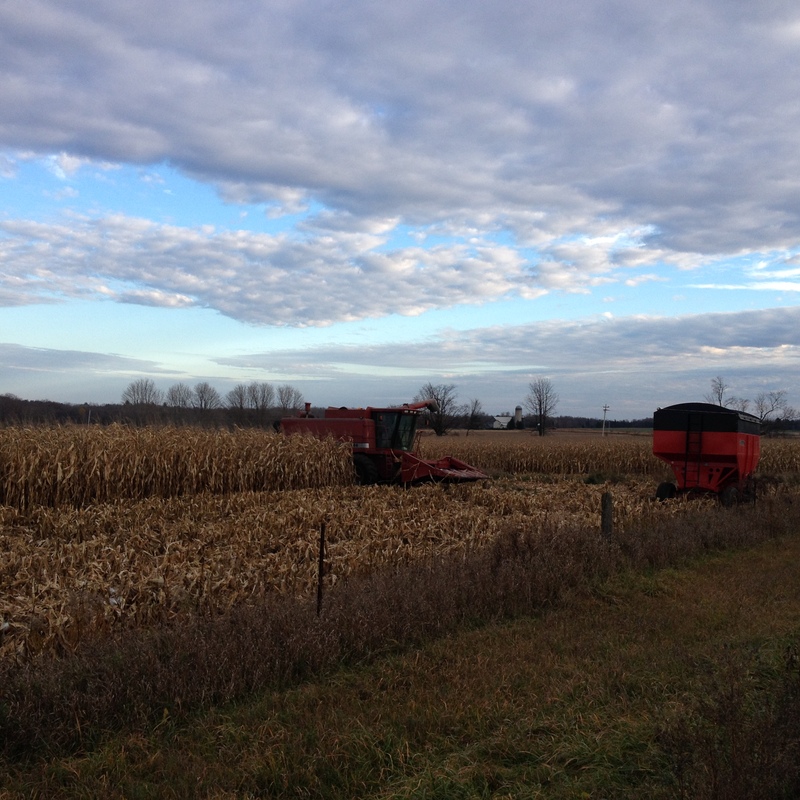 Then further up in a cornfield, where the cornstalks had still been standing until the plants had all dried up – that corn would be used for feed, I’m thinking – I was able to watch a corn harvester at work. 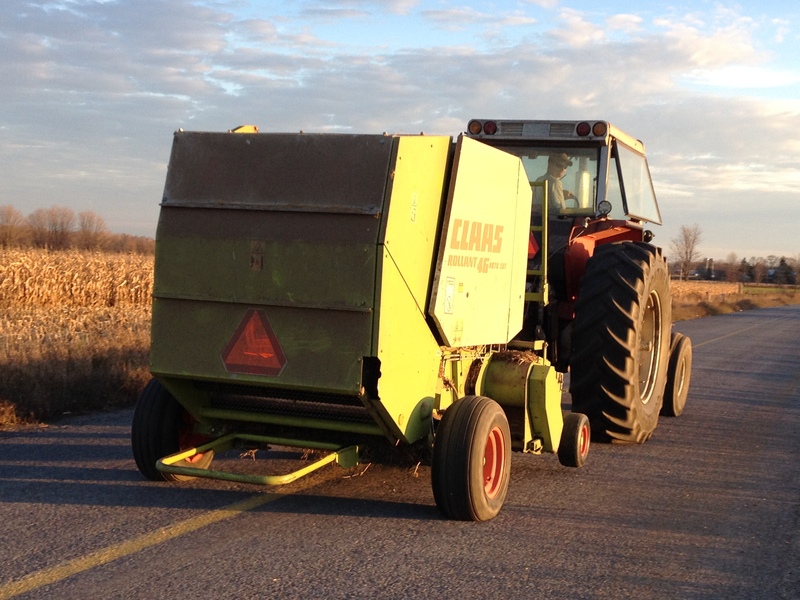 I took a whole bunch of sequential photos just on that one, so I’ve decided to only put one in this post and dedicate the next post solely to the corn harvester. 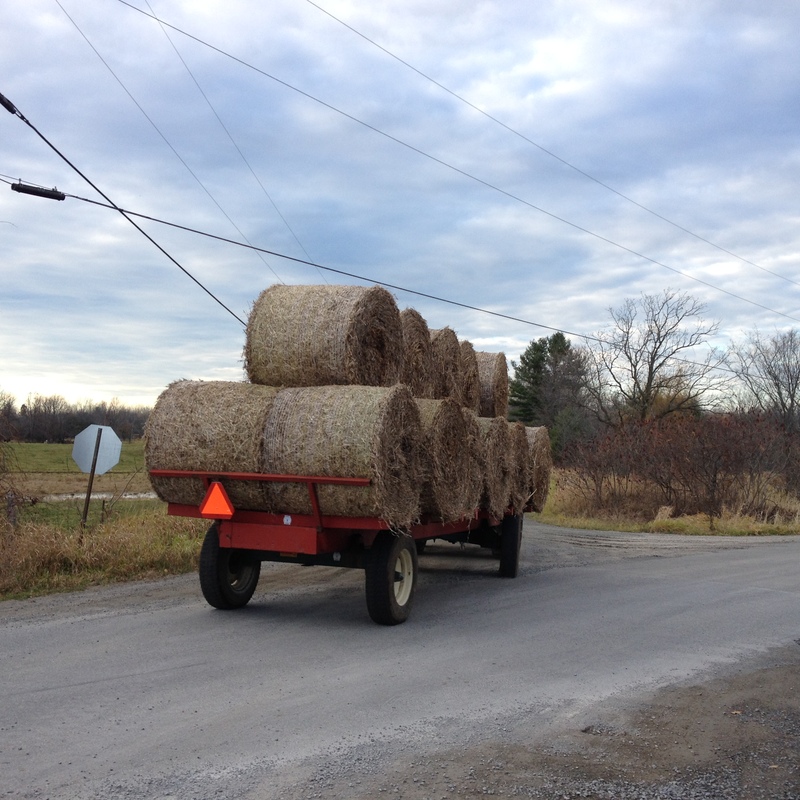 I think he was pulling the baler behind him…the kind that makes those nice circular hay bales, like you can see in the last two photos. 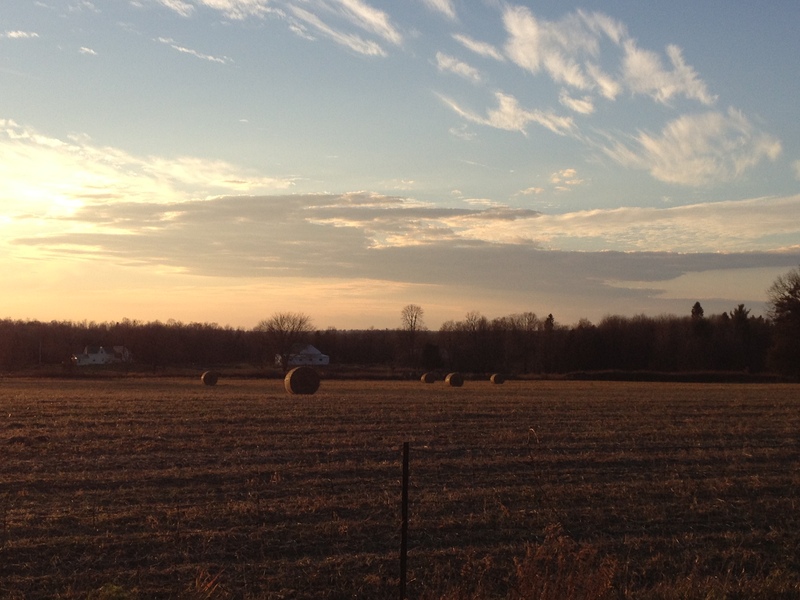 Those round bales always look so pretty in a big field under the big blue sky filled with a mix of clouds.